The event was led by Mickey Osterreicher, Esq. 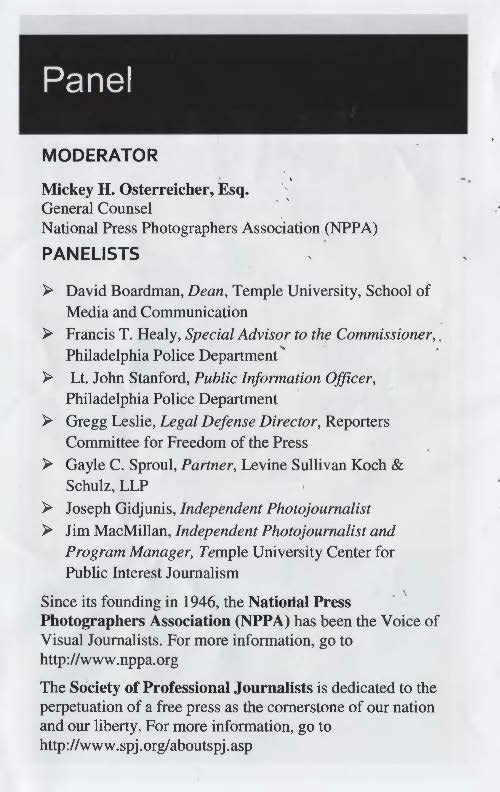 and included a panel of photographers, lawyers, and police officers. Together they fielded questions from an audience of 75 people who chose to learn about their rights rather than enjoy a beautiful summer evening. The police officers were the stars of the show, taking on a dozen pointed and relevant questions, much of which were about filming around police. 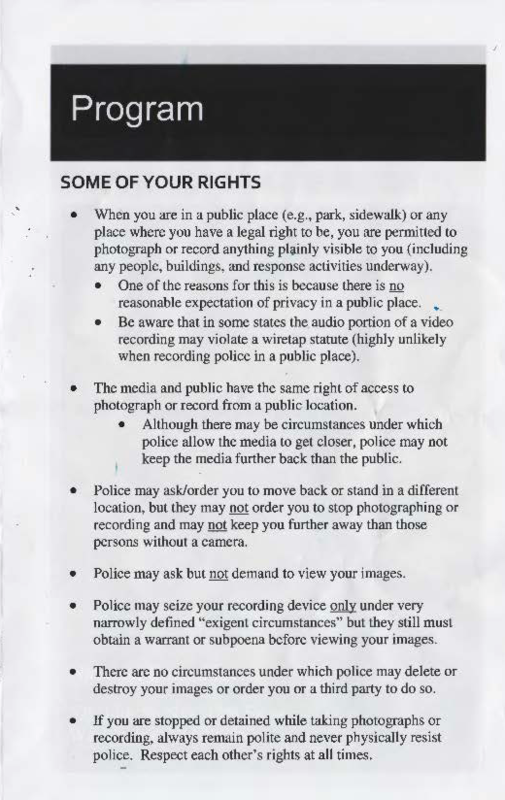 Please print the document pictured below, and keep it in your photo bag. 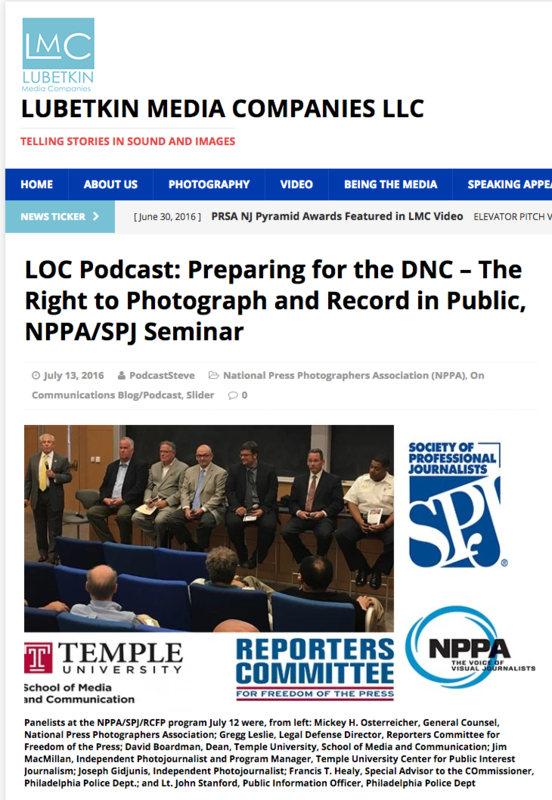 I spoke about understanding the necessity of cameras to add to the historical record and provide valuable context in this contentious time in our nation’s history, and the importance of remaining unbiased. During a protest, the environment and the tone can change quickly, and it’s important to be aware of your surroundings. Safety should always come first. Also, it’s natural to look for a sensational image, but if you capture one small chaotic piece of an otherwise calm and peaceful whole, you can easily manipulate the truth. As a photojournalist, I believe in using your journalistic integrity and not showcase the outliers as greater than the whole. Our country has endured a difficult few weeks, and there is much tension surrounding all the political parties as they navigate their stances. It’s important for our voices to be heard, for the story to be told, and for our rights to be known and understood. I look forward to us all being a part of the process these next few weeks.